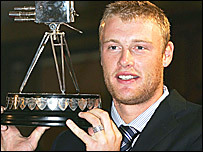 Andrew Flintoff was named BBC Sports Personality of the Year with an overwhelming victory in a public vote. The England cricketer beat sailing's Ellen MacArthur, with footballer Steven Gerrard in third. Flintoff's England team-mates were given the Team of the Year award, while football legend Pele earned the Lifetime Achievement honour. In total there were nine awards on a star-studded night of sporting celebration at BBC Television Centre. All-rounder Flintoff was the cricket folk hero of an amazing series as England beat Australia to regain the Ashes. His exuberant style evoked memories of Ian Botham, and he is the first cricketer to win the award since Botham in 1981. England's Ashes stars were voted team of the year by a special panel ahead of some strong contenders, including Champions League winners Liverpool, Premiership champions Chelsea and Six Nations stars Wales. The cricket side overcame Australia in a Test series for the first time since 1987 to reclaim the famous little urn. Twice an Olympic 1500m champion, Coe triumphed off the track by successfully leading London's bid to host the 2012 Olympic Games. Paris was long seen as favourite to succeed, but Coe expertly masterminded London's late charge. Pele, regarded by many as the greatest footballer of all tme, played for Brazil in four World Cups - including their victories in 1958, 1962 and 1970. Now aged 65, during his professional career he scored 1,280 goals in his 1,363 games. He was presented his award by Chelsea boss Jose Mourinho, who said:" Pele is football. There are many great managers and many great footballers, but he is the real special one." Pele also paid tribute to fellow footballing hero George Best, who died last month, calling him a "fantastic player." The self-styled "Special One" guided Chelsea to their first title for 50 years in his first season in charge. He beat other contenders to the award, including England cricket coach Duncan Fletcher, Liverpool manager Rafael Benitez and Wales rugby chief Mike Ruddock. Warne ended up on the losing Ashes side despite taking 40 wickets and hitting two fifties in the series. Some breathtaking deliveries cemented his place as one of the game's greatest bowlers and he endeared himself to England fans as he took defeat with good grace. The 17-year-old Surrey sprinter follows in the footsteps of footballer Wayne Rooney and tennis star Andrew Murray by winning the Young Sports Personality of the Year award. He became the first sprinter in the six-year history of the IAAF World Youth Championships to win gold in both the 100m and 200m. Former Crystal Palace and England footballer Thomas was presented with the Helen Rollason Award, named after the former BBC presenter and given for showing courage in adversity. Thomas has cycled his way to great fundraising feats, bringing in more than £150,000 for the Leukaemia Research charity. Embarking on his own Tour de France, he rode 2,200 miles in 21 days, completing all 21 stages in the same number of days as the professional cyclists. Thomas, who has fought his own battle against leukaemia, was inspired by Tour de France legend Lance Armstrong - who sent a special message of congratulations. Awarded for the winner's dedication, of more than 25 years, to West Wight Swimming Club on the Isle of Wight. Collins, from Carisbrooke, has done everything from helping to dig the pool to training top-class swimmers. He combines administration with eight coaching sessions a week, helping swimmers of all standards, while still holding down a full-time job. The award recognises an individual who works behind the scenes, on a voluntary basis, making a real difference to a sports club or team.